Home - What lives at the bottom of your garden? What lives at the bottom of your garden? As a child I can always remember thinking that fairies lived in my garden amongst the trees and bushes. But, my father always assured me that he had not seen any as he entered his shed, located in the shaded dingily dell at the far end of the garden. He spent many hours there, emerging sometimes after dark having made items for our home or wooden gifts for someone. This was his space, to loose himself in to his world of all things good, away from the stresses, strains and responsibilities of a young family. For years people have been disappearing down the garden path into their potting sheds, escaping the realities of the world they live in. For those of us without a shed to escape to we retreat into our conservatories. These well loved spaces offer us the room to relax, practice our hobbies and raise our plants within an extension of our homes, without having to disappear to the bottom of the garden. The shed consists of a felt roof, four walls, a window and a door. While the inside of the shed caters for what ever your hobby or interest desires, this confined space is a window on to your personal world. Whether the space is used wisely, or you just open the door and throw things in for storage. Sheds have been on the increase over the last few years, being alternative places to work, not only used for potting, but places to escape to that are not attached or an extension to our homes. They can be used all year round if heated; sound proofed and fitted out with all the latest gadgets to make your stay in the shed a comfortable one. Image sourced from the Telegraph of one of the entrants for this years ‘Shed of the Year 2013’ competition. After further investigation and unbeknown to many (apart from those with an obsessed shed partner), there is a massive sub-culture of shed decorators. Shed owners enjoy the challenge of changing the bland four wooden walls and roof into their own unique retreat. The sheds are made-over, added too and reincarnated on the outside to look like ships, trains, temples, cricket pavilions, air-raid shelters and used on the inside as summer houses, garden pubs (for personal use), studios and workshops that cater for all sorts of hobbies. Once inside they can seem a world away from reality, a bit like the Dr Who Tardis. They can accommodate all your treasures and hoarded items and will have many hours of tender loving care lavished on them to ensure that they fulfil the many wants of the owner. However, once a shed project is started there never seems to be quite enough space, but because of their construction they can always be made bigger, providing you have the ground space and they comply with planning regulations for their increased size. 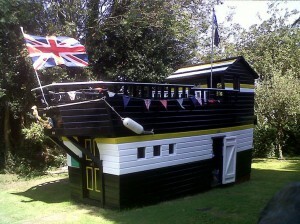 With an insatiable need for people to make their shed the best, a competition is now held annually for Shed of the Year. This year’s competition winner will be announced at the beginning of July. In a recent series of ITV’s Love your Garden, David Domoney, garden designer and TV personality can be seen ‘pimping’ old and neglected sheds into useful spaces. The sheds are transformed into spaces for people to relax and enjoy spending time in, doing hobbies or just using them as organised storage spaces. 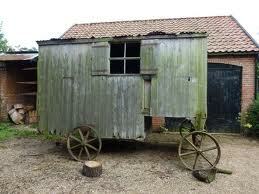 Image from Catharine Howard of a very old rotting shepherd’s hut waiting for some tlc. 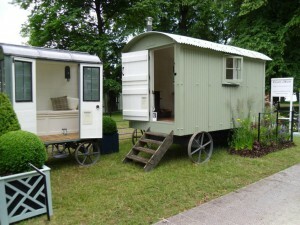 The Chelsea flower show last year had an avenue dedicated to those wonderful spaces, with the first shepherd’s hut being shown. The original huts were used by shepherds when looking after their flocks of sheep. As the sheep roamed the countryside for days and weeks at a time, the hut on wheels equipped with a bed and a stove was moved around by a horse following the sheep. It was often too far and remote for people to return home at night and the flock needed to be watched over to prevent attack by foxes, wolves and birds of prey. These days, shepherd’s huts are being remodelled and used for other things such as luxury sleeping spaces, additional workshops and posh chicken coops. A shepherd hut can be moved around the garden on their wheels into areas that are usually more difficult to access and take advantage of the elevated views from their deck and the moving sun. A shepherds hut on display at Hampton Court Flower Show in 2012. If you are looking for inspirational ideas for your shed why not take a look at readers sheds which will offer you lots of amazing pictures, ideas and advice on how your shed can look with a little planning and effort. 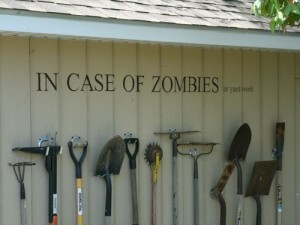 Not that we think any of you have a problem, but I could not resist this image from Gaglolstyle. com it’s not quite the same as having fairies! 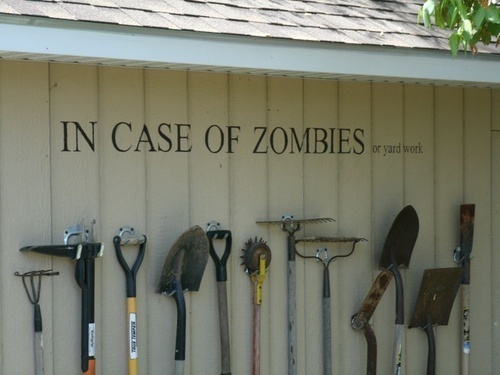 Have you decorated your shed and organised the space or is it just a well used and loved garden shed that you sometimes struggle to get into? We would love to see a picture of your garden shed and hear about the fairies at the bottom of your garden, if you have any!